A revised and updated edition of the essential working manual for all those involved in geotechnical laboratory testing. This volume, the first in a set of three, is a vital working manual which covers the basic tests for the classification and compaction characteristics of engineering soils. 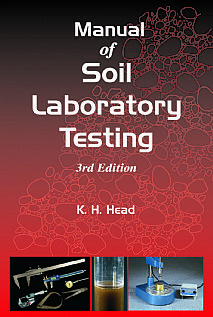 It will therefore be an essential practical handbook for all engaged on the testing of soils in a laboratory for building and civil engineering purposes. Based on the author's experience over many years managing large soil testing laboratories, particular emphasis has been placed on ensuring that procedures are fully understood. Each test procedure has therefore been broken down into simple stages with each step being clearly described. The use of flow diagrams and the setting out of test data and calculations will be of great benefit, especially for the newcomer to soil testing. The book is complemented with many numerical examples which illustrate the methods of calculation and graphical presentations of typical results. The reporting of test data is also explained. Vital information on good techniques, laboratory safety, the calibration of measuring instruments, essential checks on equipment, and laboratory accreditation are all included. A basic knowledge of mathematics, physics and chemistry is assumed but some of the fundamental principles that are essential in soil testing are explained where appropriate.